- ½ bottle white wine. Mix mustard, garlic, pepper and rub this mixture all over and in turkey. 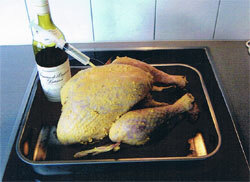 and in the meantime inject white wine twice a day. Stuff it with the filling, with string tie the legs and tail and cover pan with a loose tent of foil paper. brown, basting it with pan drippings. To serve, decorate a platter with grapes and herbs, place turkey in middle and pour gravy all over. Heat oil, mix and cook all above ingredients except almonds. Roast almonds in small pan with a bit of oil, then mix with the meat mixture and stuff the turkey. Mix a bit of chicken broth and flour to avoid lumps, then add rest into a saucepan. 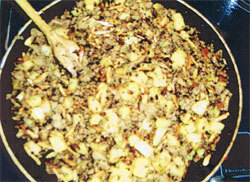 add rest of ingredients, stir until gravy boils and thickens slightly.